Almost everyone knows someone with a serious ailment against which conventional medical treatment has failed. Many conditions seem to defy treatment, leaving victims, if not completely debilitated, feeling less than healthy. And many doctors today hate their profession, frustrated by poor success rates and the strictures of the medical insurance machine. 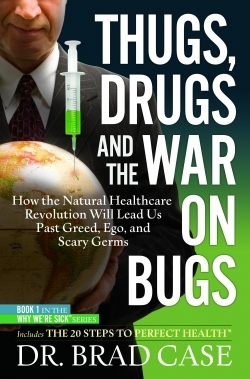 Patients and doctors alike will want to read this book about the essence of modern medicine and the way, according to the author, it fails people in the United States. The author is a chiropractor who uses naturopathic techniques that include everything from herbal medicine and homeopathy to massage, spinal manipulation, acupuncture, nutrition, lifestyle counseling, and mind-body medicine. He gives a brief background on not only his own designation but also osteopathy, chiropractic, homeopathy, and other “alternative” healing techniques. He decries the term “alternative” because, he says, it implies these techniques are less effective than those of allopathic (conventional) medicine. In fact, as he writes, allopathic methods treat symptoms rather than causes, are ineffective in maintaining health, and are better thought of as crisis intervention techniques. Statistics and documentation are included to support his case. There’s also an extensive bibliography in the back, as well as suggestions for further reading. In this first volume of a planned Why We’re Sick series, Case focuses primarily on the shortcomings of conventional medicine. He points to several conflicts of interest between “Big Pharma” and the US Food and Drug Administration, and relates how pharmaceutical companies court doctors with everything from free samples to free seminars in exotic locations. The American Medical Association, in his opinion, protects and enriches its members by driving out the “alternative” competition. Further, most conventional medicines, far from being efficacious, are nothing but mild (or not-so-mild) poisons. Vaccinations, AIDS, flu, autism, viruses, antibiotics, and parasites are all addressed. Case does include some comparisons of conventional medicine with alternative fields, and some information on treatments that do not involve drugs or conventional therapy. This book is extremely accessible. The author’s engaging voice encourages one to keep reading with as much enthusiasm as if the book were a thriller. His clear, critical tone and readable arguments will hold an audience with ease. The book is refreshing, if frightening, and confirms suspicions many may have about the efficacy of the modern medical system. Even those who don’t agree with him will be stimulated to debate at least some of the allegations he makes.